**Disclosure: Product was received for the purpose of facilitating this review. No compensation was received. All opinions are 100% my own. 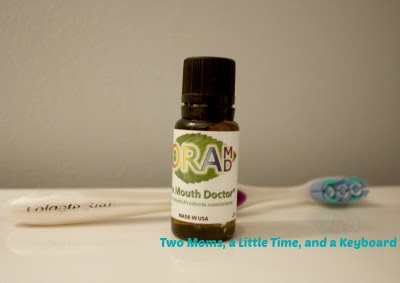 Recently, I received the opportunity to try OraMD, a natural liquid toothpaste, mouthwash and breath freshener. I am currently in the process of unjunking my cosmetics (a long process, indeed), so I thought that I would give it a try. The product does come in a small, neat little bottle. Being an oil, however, a little goes a long way. When you use the product, you will only need a few drops. The bottle easily dispenses the product. No issues! OraMD does take a bit of time to get used to. Oils are pretty strong by nature. When using, be sure to follow instructions. When you are instructed to use just 2-5 drops for toothpaste, stick to this. I found the OraMD to be a little strong for me as toothpaste, even after the 7 day trial period. I would recommend starting with just the 2 drops at first. I also used OraMD as a mouthwash. As a mouthwash, I combined a couple of drops with water. Easy! I found that the product quickly and effectively freshened my breath. As a mouthwash, I did not find OraMD to be too strong! Since OraMD is in a compact bottle, you can easily bring it with you for breath freshening purposes! Would you like to try OraMD for yourself? The manufacturer is willing to offer my readers one FREE bottle. They would love to have our readers try out OraMD and will send one bottle FREE if our readers would pay a minimal shipping and handling charge. They will include 2 eye-opening reports called 1) “The 6 Hidden Dangers In Toothpaste” and 2) “Why The FDA Requires A Warning Label On Your Toothpaste.” That’s a total value of over $40.00. Click here for this offer. I'd love to try this as a toothpaste. I would like to try this as a toothpaste! I would like to try it as a toothpaste.